Calling all land regenerators, earth walkers, and friends of the weeds! You can help heal our lands, today, with the resources you have and the love you have to give. What if, instead of doing less harm or less baad, we could do good? We could work to heal? In this post, I’m going to talk about the process of gathering, scattering, and sowing seeds, nuts, and roots in regenerating our lands. This perspective is of the wildtender, the seed scatterer, the weed wise wo(man). This is four-part series on Wildtending that I’ll be presenting over the next month–the first giving the “how to” and philosophy (this post) spiraling from my earlier writings throughout this year. So, grab a handful of seeds, nuts, and roots and let’s get started. 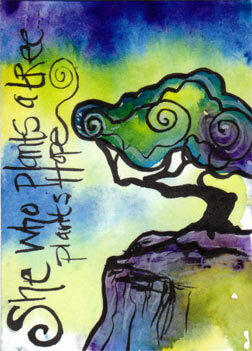 I recently came across a story called “The Man who Planted Trees and Grew Happiness” by Jean Giono. His story talks about the actions of one man, Elzéard Bouffier, who planted trees in a barren plane, and over a period of years, planted a huge forest on the barren landscape where he lived–the forest brought back water, people, and abundant life. One man’s small mission ended up transforming the lives of so many. Before you continue reading my post, I really, really, really suggest you stop and read his story. (A PDF of the full story is here: The Man Who Planted Trees and Grew Happiness; A Youtube Animated Video is here.) This story is empowering–it shows us that the actions of one person, determined, over time, can really regenerate a whole ecosystem. I talk a lot about wildcrafting on this blog, both in terms of wild food foraging and healing medicine. And I firmly believe that gathering from the land is important. Wildcrafting is the half of the equation that gets people into the woods or into a field of weeds–going off to find wild mushrooms or berries, reconnecting to nature, and taking nature within ourselves. Its the half that encourages people to help protect wild lands and places. Its the half that allows nature to heal us through her mere presence and through her medicine. Its the half that helps people appreciate nature and her bounty–but its only half of the equation and that’s an important piece to understand. 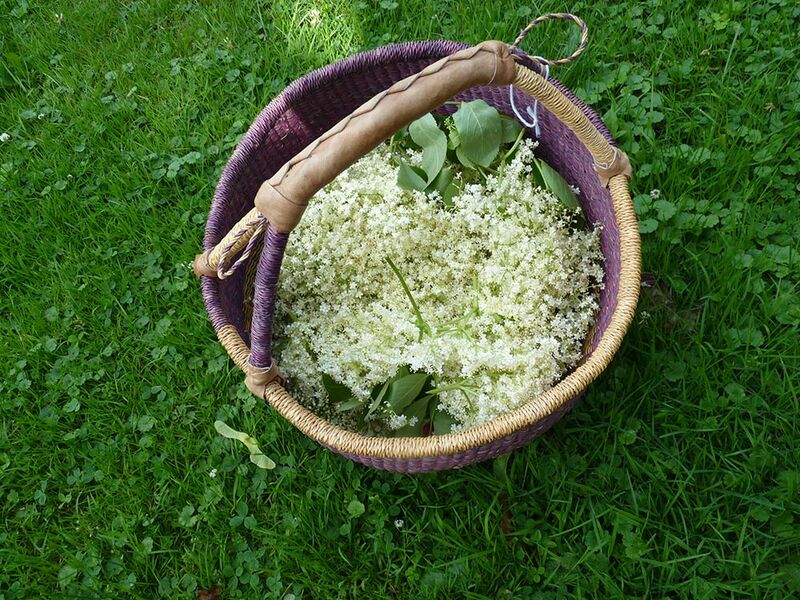 When you forage in lands that are abundant and healthy, you can’t see the need for doing anything but being present and thankful, maybe taking a handful of the seeds from what you are harvesting and scattering them a little further as a sign of thanks. However, when the plants that you found in abundance in one area are non-existent in another, you start to see patterns of problems that emerge. In fact, it was my wildcrafting practice in PA, in such damaged and pillaged lands, that has led me to this line of thinking and understanding. Stories like “The Man Who Planted Trees” remind me of the importance of balance, a principle resonated in the ying-yang, or the sun-moon, or any other balanced pairing. 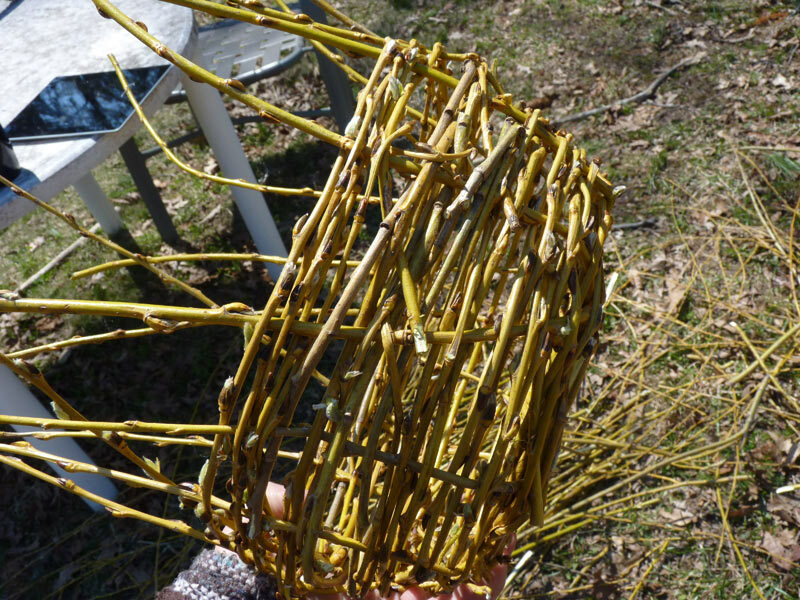 This is that wildcrafting (that is, ethically harvesting from from nature) must be balanced with wildtending (that is, returning to or giving to nature). Our lands desperately need wildtending. The most important thing to understand about wildtending is this: Nature already knows how to heal herself. All we have to do is to help setup the right conditions for healing. 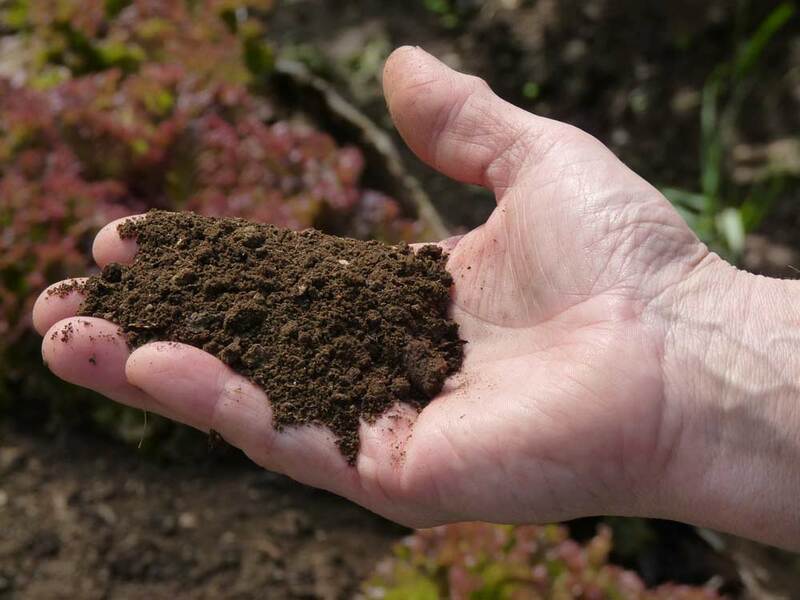 We need to literally sow the seeds and help the soil–and nature will do the rest! The problem we face today is simple: nature doesn’t always have the seeds or resources she needs to heal. We have a tremendous loss of biodiversity (both plant and animal life) caused by severe damage to our lands, from clear-cutting or logging forests, to creating of monocrop industrialized agriculture and lawns, to spraying and toxins. Mines and factories are polluting our rivers. Our topsoils are being eroded at an alarming rate. On top of this, our infrastructure (roads, fields, cities) and human activities prevent the natural spread of seeds and roots; further, the decline in bird populations and wildlife that would spread the seeds mean that less seeds are spread. At literally every point in our ecosystem–something is causing damage. Finally, humans themselves, who used to tend the land and spread seed regularly, no longer engage in this practice. We don’t know how, for one, and most of us are afraid to do so, for fear of causing more harm. Even for those who see the land as sacred, who hear the land’s call–we are so afraid to do anything that might harm her further. And yet, the need is great. 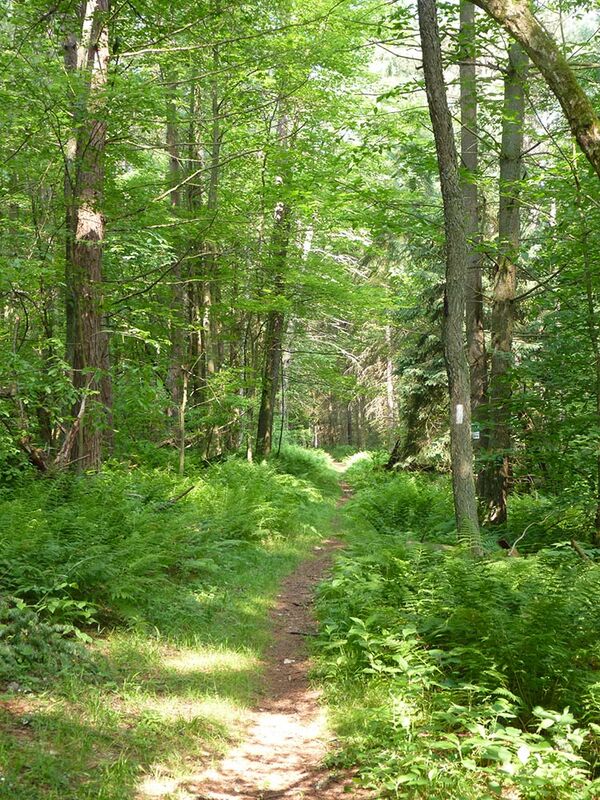 Most of our forests and lands–even those that *appear* healthy when you walk into them, are currently devoid of may major medicinals and botanicals that once grew abundantly there. Many critically endangered plants don’t thrive on disturbance like their weedy cousins–rather, they thrive in areas that are undisturbed. And what forest or field has remained undisturbed in the last few hundred years, at least in the USA? Very, very few. This means we have a situation where its harder for nature to heal because she lacks the seed stores and biological diversity to do so. I’ll give you an direct example here of what I mean–in the forest below my parents’ house, almost 90% of it has been repeatedly logged–except for about a 5 acre section which, for whatever reason, has been largely spared. This section is perfect for growing certain wet and dark-loving forest plants due to its wet conditions and small early-year springs. 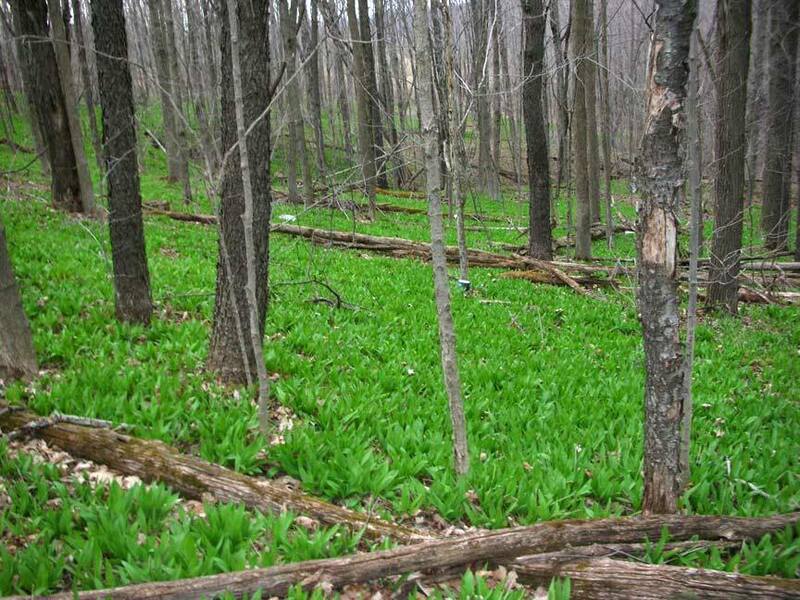 Abundant ramps, along with blue cohosh, white and red trillium, may apples, and trout lilies are all over this small piece of land. Everything I’ve listed, with the exception of trout lilies, show up on one of the United Plant Saver’s “at risk” or “to watch” lists–endangered medicinal and key species of plants, now disappearing from our lands. An invisible line is present in that forest–as soon as you step into the areas that have been logged within the last 30 years, the forest floor is no longer carpeted with these spring plants–instead, its mostly bare on the forest floor. Now to be clear–nothing else appears to be changed–the forest canopy is still there, the larger trees grow around. Only knowing the history of this land, and where has been disturbed, and where hasn’t been, allows me to understand the dividing line between ecological sanctuary and ecological wasteland. There are lots of spaces just like this forest–spaces that used to have important plants and biodiversity, and due to various human activities, no longer do. Only knowing what once grew there can help us bring it back. The practice of wild tending and seed scattering is putting the tools–the plants–back in nature’s hands for healing work. Principles of Wildtending: What to Do? Wildtending can take many different approaches, but the one we’ll talk about today is the magic of the seed. The magic of the seed is something that each of us can know. A simple practice is to start a seed on a paper towel and to simply watch it grow. The lessons within the seed are profound. You get this same experience when you watch sprouts on your counter–that magical seed breaks forth from its casing and sends roots down and a shoot up. Some seeds are so special that they pull moisture towards themselves and retain it for earlier and easier sprouting. It is embracing this magic of the seed where we can start our work. How do I know what do do? The first big question in wildtending is this–how do I know what to sow? How do I know it will be beneficial and not harmful? The two keys are the act of careful observation and second is ecological knowledge. Careful observation. As I grow more and more deeply into my herbalist practice, it has given me perspective on the number and abundance of plants of many different kinds. Where you can find calamus (sweet flag), skullcap, or lobelia; how rare plants like goldenseal or even black cohosh are to see. 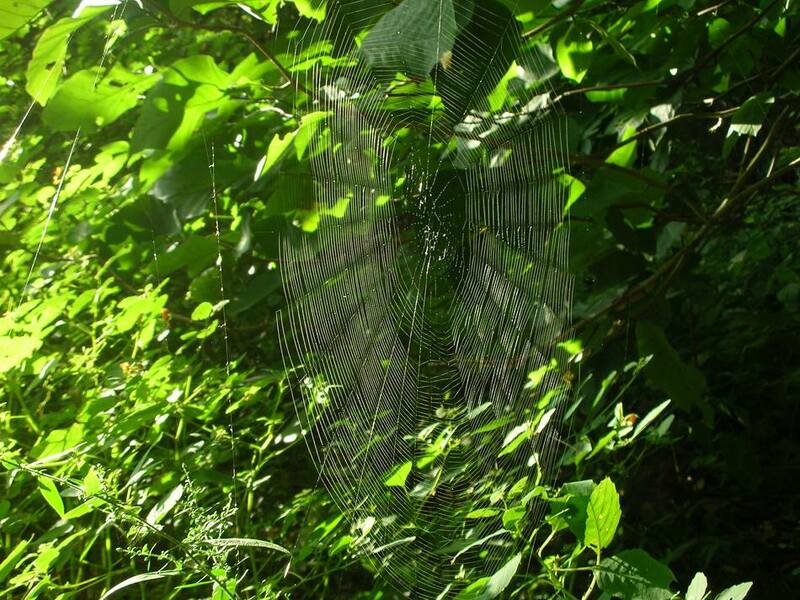 As a permaculture designer, I also know how to look at ecosystems and understand their needs–how they function, the different roles of plants, and how to encourage ecological succession and healing. These two perspectives, I think, help me answer this question. This question must be asked and answered as locally as possible–what your lands need depend on what they are lacking, and you figuring out what that might be. There are, however, a few places to begin. I want to draw your attention to an organization that has been around since the 1970’s, started by Rosemary Gladstar called The United Plant Savers. They have a list of plants currently endangered or nearing being endangered–this list, I find, is a good place to start. When you study this list, you can see that the plants fall into a couple of different bioregions and a couple of different groupings. I would also draw your attention to ecological and natural histories of the area–what exactly grew in your region, in the various biodiverse microclimates, before the present day? 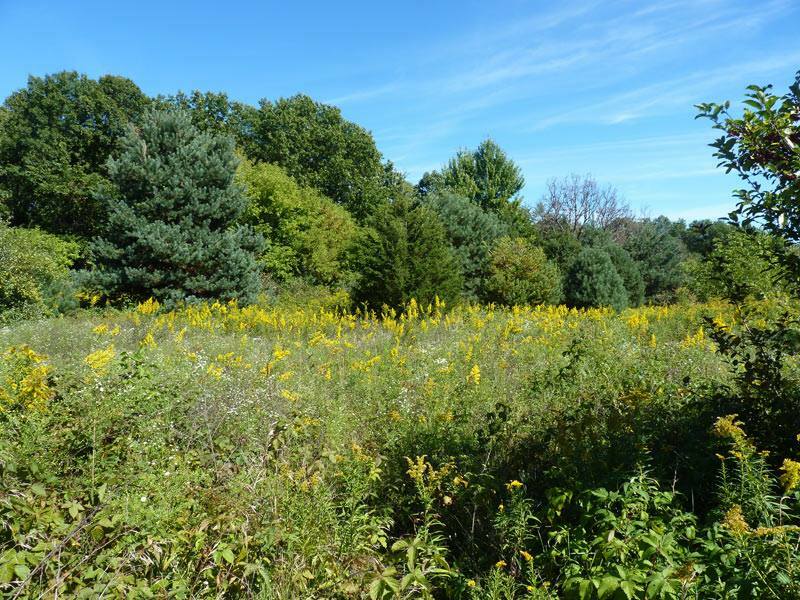 Are there areas that have been reseeded with native plants that you can go visit and learn from? These are good places to look. For example, a set of local books (nearly all older) helped me fill in the gaps. About six months ago, I found key information on what PA’s forests had been like prior to clear cutting in an old, hardbound report from the PA Department of Agriculture’s forestry division published in 1890. They had a list of the makeup of PA’s forests with percentages of trees that allowed me to know exactly what trees were here once, and what trees had thrived here, prior to logging. I compared this to what I find in the forests now, and have a clear sense of what kinds of nuts and tree seeds I want to bring back (hardwoods like oak, hickory, walnut, butternut, and chestnut top my list–especially chestnut, which used to comprise almost 20% of our forests! I don’t think this was by accident, but by careful tending on the part of the Native Americans who lived here and tended the wilds). How do I know I won’t do more harm than good? I also want to speak here about fear. A lot of people don’t want to do this kind of thing cause they are afraid of screwing up nature, planting something “wrong.” Let me tell you–so many people are doing things wrong right now, and very little of it has anything to do with wanting to be of service and help. I suggest using your mind and your heart. In terms of using your mind, As long as you research carefully,stick with native or naturalized species, and target areas that really need your help (see below), its hard to do something wrong. You don’t have to start by healing every damaged patch of soil–pick one or two places to target your energies, pick one or two species of plants to work with (milkweed or pleurisy root are great first time plants for my bioregion) and start there. Its also important to use your heart. Trust your intuition here, listen to the voices of the land, and know that your heart is in the right place. Principles of Wildtending: How do I know what to plant? Different ecosystems require different kinds of seeds and approaches. I have divided up my efforts here based on the ecosystem and immediate need. Let’s start by examining the concept of a “plant guild” in Permaculture and then move into some specific approaches based on different ecosystems. Understanding Plant Communities (Guilds): If you know enough about ecology, you’ll start to understand that a healthy ecosystem has a variety of self-sustaining systems; each plant has a particular role. This is why you often find the same groupings of plants in the same area–they form a “guild” that all work together (I think about the spring ephemeral plants in the patch of forest I discussed earlier–ramps, dutchman’s breeches, trillium, mayflowers, and blue cohosh along with woodland nettles, all under maples, oaks, and cherries primarily). Our goal, as land tenders, should be to help cultivate these self-sustaining plant guilds and re-introduce plants that were once part of these healthy ecosystems. Permaculture design typically recognizes seven kinds of plants in terms of the height of the plant (the horizon). For example, in a mature forest, seven layers (especially on that edge of the forest) is present: the tree canopy (overstory; tulip poplar, white pine, oak); the understory tree (shorter trees; shade tolerant like hawthorn, pawpaw or hemlock); shrubs (blueberry, spicebush, brambles); herbaceous (stoneroot, ferns, blue cohosh); groundcover (ramps, wintergreen, patrtidgeberry); vining (ground nut, wild grape); and the root zone (which has itself different levels). Fields, edge zones, and the like may not have all seven layers. Logged forests or those that lack ecological diversity also likewise might not have all seven layers. (For more on this in a home gardening/home ecosystem context, look at material found here and in the really great free PDF here.). Likewise, permaculture recognizes that a healthy grouping of plants in a forest or field or anywhere else is not a monocrop but a set of plants that often work in conjunction (that’s not to say there isn’t competition, but there is also a lot of collaboration). We call these plant groupings “guilds.” These could include nitrogen fixers (most legumes), nutrient accumulators/dyanmic accumulators (those that pull up nutrients from deep in the soil, like burdock or comfrey); nectary plants (pollen and nectar plants), biomass plants (those that create carbon-rich soil; like leaves from the fall); along with any edible or medicinal qualities. Other plants may provide beneficial shade, provide a strong trunk for a climbing vine, and so on. And I’m only talking about plants here–there’s also fungal activity and the soil web of life, animal foraging, insects, weather, microclimates, and much more, all working together. 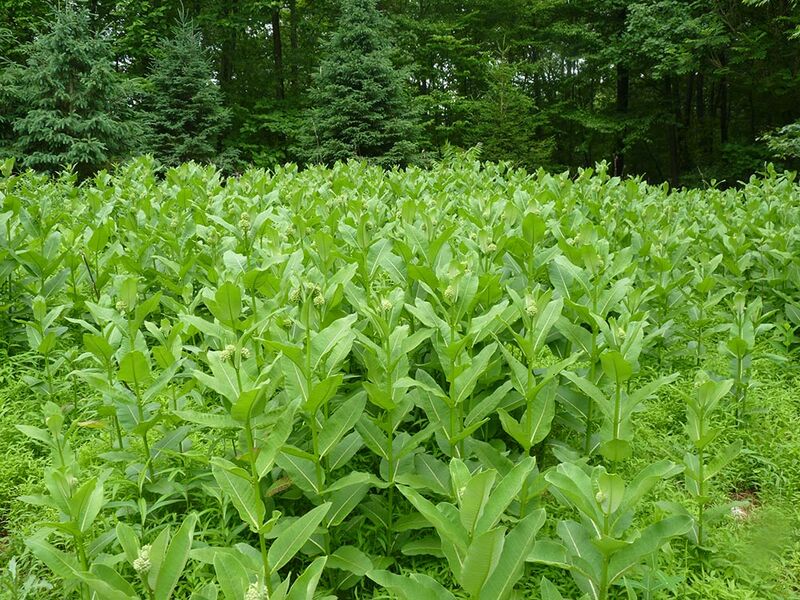 A field of milkweed–a rare sight today. I haven’t given you specific lists of plants here because my lists would not be the same as your lists–this is work that each of us needs to do. I can share my lists, and I hope that others can share theirs as well! I will be sharing some of my typical lists below. I’d also recommend for those really serious to this work to check out Dave Jackie’s Edible Forest Gardens books–they contain the most detailed information on plant guilds for more cultivated plants (although I am generally distrustful of the herbal information in their books, they are otherwise really fantastic). James Howard Kunsler talks at length about the places and spaces that “nobody cares about” in relationship to urban planning and architecture. I believe we can apply this same principle to our lands. The strip of bare earth behind a strip mall; the insipid moncrops along our highways; the recent construction site stripped bare of its soil; even the logged forest quickly regrowing. These places, places that have been exploited and stripped, are prime areas for us to begin our wildtending work. Why? They are places that nobody cares about, that nobody is tending–and those are the places that need wildtenders the most. Bare Earth, Damaged Soil. Sometimes you come across a place that has no topsoil and is simply exposed bare earth. These kind of situations, from my perspective, are “triage” situations–and this is where the plants that many call “invasives” thrive (after the soil is re-established, these plants almost always disappear and ecological succession continues). Road construction is a good example; when they are done, they maybe will scatter some seeds or plant some grass, but really, a lot of it just sits bare. Another good choice is a bare area where logging occurred and its having difficulty coming back. Or, one that I’ve been studying quite a bit since returning home–a “boney dump” where mine refuse (primary shale, still bare after 50-100 years) was piled up in huge piles and left to sit (I’ll write about these at length one of these days). Or when the utility company comes through and digs something up, then leaves without planting anything. There are lots of “bare earth” places in our landscape, and usually they are neglected. These are *perfect* opportunities to begin our work as land tenders! In these kinds of situations, think really carefully about how far along the ecological succession line you want to encourage this piece of ground to grow. If its under power lines, planting a bunch of oaks is not the wisest course of action because in 20 years, they will be cut down. Instead, here, I’d encourage a herbaceous and groundcover plants would work well or shrubbery that won’t get that high and that will provide good nutrition or forage or nitrogen fixing or whatever it is you want to provide. The combinations of plants that I’ve used on these kind of situation are: butterfly weed (pluresy root) being one of my favorites and on the endangered list, milkweeds, along with burdock, Echinacea (mid-season bloom), New England Aster (for late blooms), Mullein (medicinal), and Alfalfa (nitrgoen fixer, mid-season bloom). These plants thrive in full sun kinds of situations and once established, are perennial. Not to mention that if there isn’t spraying happening, you can come back at some point, gather more seeds, and maybe even some medicine if the conditions are ok for it :). The Monocrop. Along our highways in many parts of the USA, we see the monocrop. Driving to visit friends and observing the highways in different seasons of the year was actually one of the inspirations for this whole line of thinking and practice–I was thinking to myself how many millions of acres are along highways and how so few of them grow anything beneficial to the land. These are also, in James Howard Kunsler’s terms, spaces that nobody cares about. 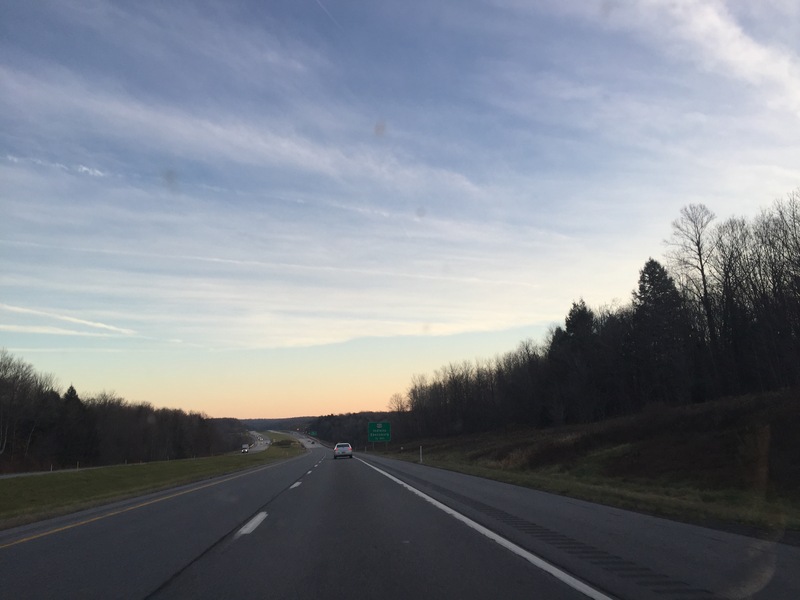 In the case of many of our highways in PA, they only mow the very edges, and many of them are on un-mowable hillsides. Usually after road construction, bridge building, etc, the highway has been replanted with crown vetch or grass….essentially, a monocrop. The thinking here is not about the ecosystem at all but about keeping something on the surface to prevent drainage and erosion. But, dear friends, we can do better. I actually like some of the same mix for this that I shared above–in this case, my focus is really on nectar-producing plants to help our pollinators along. My other focus is on making sure there are pockets of plants that can function like “arcs” to spread ones that we need more of along. For these spaces, I use seed balls (see my upcoming 3rd post in the series) which can easily be lobbed from a car when nobody is looking or late at night! Another place that’s good for this is along train tracks–again, places nobody cares about. You can cultivate really incredible and diverse ecosystems here on these edge spaces. The Nooks and Crannies: There are lots of little nooks and crannies, small patches of land without much growing on them. They are really all over the place–just open your eyes and see what you can add :). The strips of bare land are only one kind of wildtending that can be done. After nature begins her own process of healing, you’ll find a beautiful tangle or thicket of wild plants, although, depending on the area, you might not find diversity. Here, our mission is a bit different–simply to bring more biodiversity and help support waning plant populations. The Recovering Edge of Land. You’ll come across the wild patch that was once barren and has sprung up again–this collection of beautiful plants (not weeds) often comes forth from whatever was there before in the soil and remained or whatever was wind-blown or bird-dropped into that small space. In my area, these small patches are usually full of goldenrod and late-blooming white aster, maybe some brambles or staghorn sumac. I like to add a bit of diversity to these small patches and encourage the spread of certain kinds of plants–milkweed is a favorite of mine for these spaces, and if its a little damp, I also like to add st. john’s wort, blue vervain and echinacea. I also like to plant hardwoods here to help encourage ecological succession long-term. The Recovering Fields. Then there are the fields that were once farmed, and for whatever reason, are no longer farmed and are slowly returning to forest. I have a two-pronged approach for this–one is to encourage plant diversity during ecological succession (and my favorite for this are the plants mentioned above as well as berry crops like wild black raspberry), but my longer goal here is to spread hardwood species of trees that are very rare. My particular selection of trees is based on the context of Western PA–these are the trees that don’t recover well after logging and/or were intentionally cut: oak (especially white oak), chestnut (blight resistant), slippery elm (endangered), hickory (of all kinds, especially shagbark), butternut, and walnut. I also think about the understory trees and the need for other kinds of fruit, and plant hawthorn and apple trees (and pawpaw, especially, if I can get my hands on seeds). Woodlands. Just because you see a mature woodland doesn’t mean the species growing there are necessarily all the species that once did. For regenerating this kind of space, I focus my energies on targeted endangered species that need to be re-introduced to our woodlands. I do this carefully though, depending on the kind of forest I’m in. In Pennsylvania at least, this land was almost entirely stripped to the bare earth during the logging boom that started in the 19th and carried through till the early 20th century. Even since then, logging of much of PA continues. While many of our lands repopulated (as nature has a way of doing that), delicate species may not have repopulated with them. Delicate species, often those having high medicinal value or having slow propagation times (or both) have never recovered. Scattering New England Aster seeds…. Sites that will not be logged again– This is typically where I focus my energies in forests currently. These are sites that may be actively protected (State Forests or local forests) or other lands that are private but owned by people who won’t cut them. After the devastation of logging 100 years ago, a lot of forests around here are now 2nd or 3rd growth forests. The 500 acre patch of land here that I often visit here in my town is like that–you can find remnants of buildings and foundations in there, and there are fracking wells in there, but largely, the land has regrown. 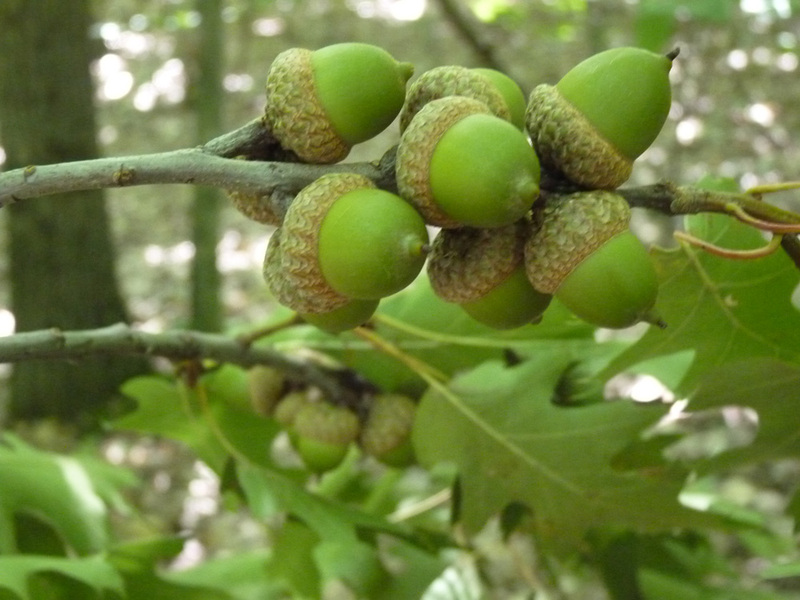 Its primarily a tulip-chestnut oak-red oak-maple forest, with a lot of birch and a few beeches as well. Its a healthy forest in terms of trees, but there isn’t a lot of forest floor plants. So my focus in this area is twofold. First, I work to bring back chestnuts, which once comprised upwards of 15-20% of our forests. I do this by planting chestnuts in areas where there is a “gap” with the hopes that they might make it–e.g. a large tree has fallen, allowing a patch for something new to grow up. I also plant understory trees that can make it–paw paw here is my favorite of these. 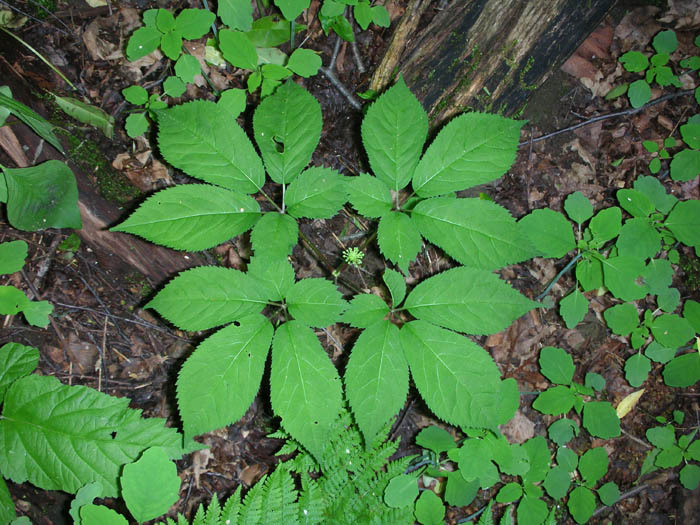 Second, I work to bring back woodland medicinals currently under severe threat: goldenseal, ginseng, and black cohosh. There are others, but these are the three I’m learning to grow and cultivate, both in terms of how to help them grow and also in the specific ecosystems they like. Sites that will be logged again – I don’t always do much with these sites in terms of planting new medicine or trees, as I’m still learning which plants can recover from this kind of abuse. Right now, most of my work with forests in the logging rotation is energetic healing work (more on this in later posts, some of this is also here). I think this will change as I discover which plants can survive and which can help a forest recover quickly. As a simple example of this, I return to the patch of forest behind my parents’ house. I see what the logging does to those critical woodland species, and I’m not sure trying to bring them back in the face of more logging makes any sense. My point is that sites that have ongoing ecological devastation might not be the best for this kind of work–but there’s still much we can do. Now that we’ve talked about what to plant, where to plant it, and all of that, its time to talk about how to build this into your practice. It can actually be really simple and all it takes is a little extra preparation. If you are already in the business of going outside fairly often, have some seeds or nuts with you that are appropriate for the areas where you’ll be planting. 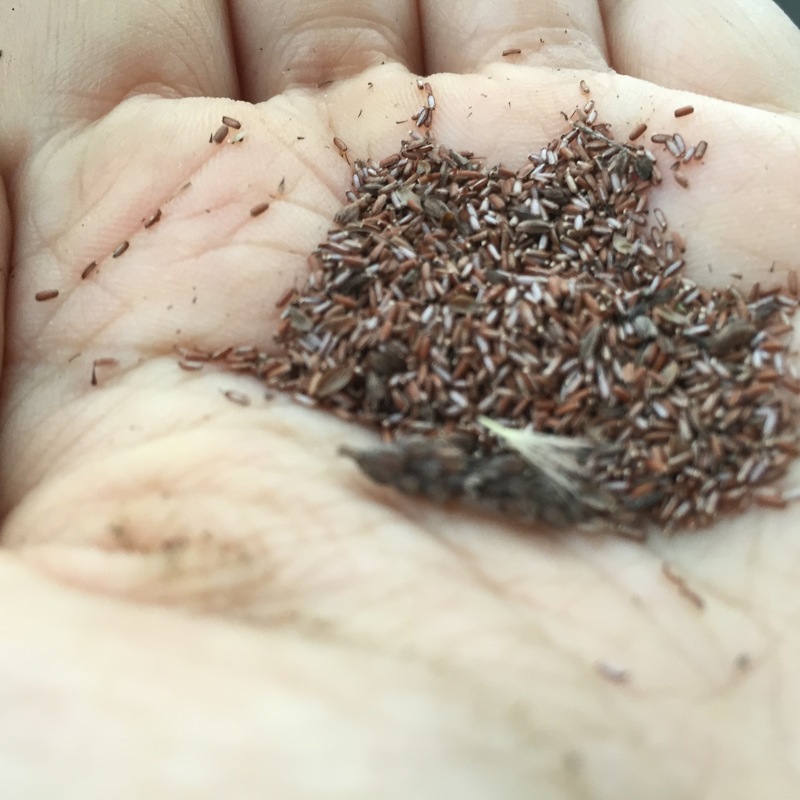 Seeds are resilient–even if they are planted at the wrong season, they can often survive in the wild and come back up the following spring. The very first and best thing you can do is start scattering seeds that are appropriate, popping nuts in the ground, and go from there. If you see small seedling trees coming up that won’t make it where they are sprouting, dig them up and take them somewhere where they will thrive. This work is simple, and can be built into your existing forays into this great, beautiful planet. I’ve outlined a number of different ways you might work to be a wildtender as much as a wildcrafter. I hope you’ll take up the call! Look for the plants that we need in more abundance that benefit our ecosystem, that heal our bodies, that encourage health and forage. Start with the list on United Plant Savers, and also consider trees that are in need of more planting in your bioregion. These plants and trees…let’s sow them–everywhere. Scatter them far and wide. Gather their seeds and spill them out of our skirts and pockets. Throw seed balls (I’ll talk about these in an upcoming post) into recently grated highway dirt piles, “waste land” or stripped soil. Let’s work with our plant allies to put down the deep roots and begin the healing process. A lone man walks through a field of brambles as the sun rises, a small pouch at his side. This field was old-growth forest before being clear cut a century or more ago; it was then farmland for 50 years before becoming unfarmable wasteland; over the last 15 years, enough soil fertility has returned enough to support the brambles. As the man walks, every so often, he leans down, takes out a small trowel, and pops a nut in the ground–hickory and oak nuts, primarily, but others like butternut, chestnut, and walnut are also sometimes planted. He is a man on a very quiet and very personal mission–and his goal is simple: to return hardwoods to the cleared lands of Western Pennsylvania. Sometimes, he carries roots instead: the roots of goldenseal and ginseng, plants once common here and are now about impossible to find. This man plants trees that he will not likely ever harvest from, he walks lands that others have abandoned, and he donates his time to this simple, meditative practice. Who is this man? This man is my father, and his work is for generations–human and otherwise–beyond himself. The question our role as humans is in the ecosystem and how spiritual practices and permaculture design allows us to better enact that role is an important one. In this post, I’ll explore the idea of an earth care ethic through active regeneration of the land. 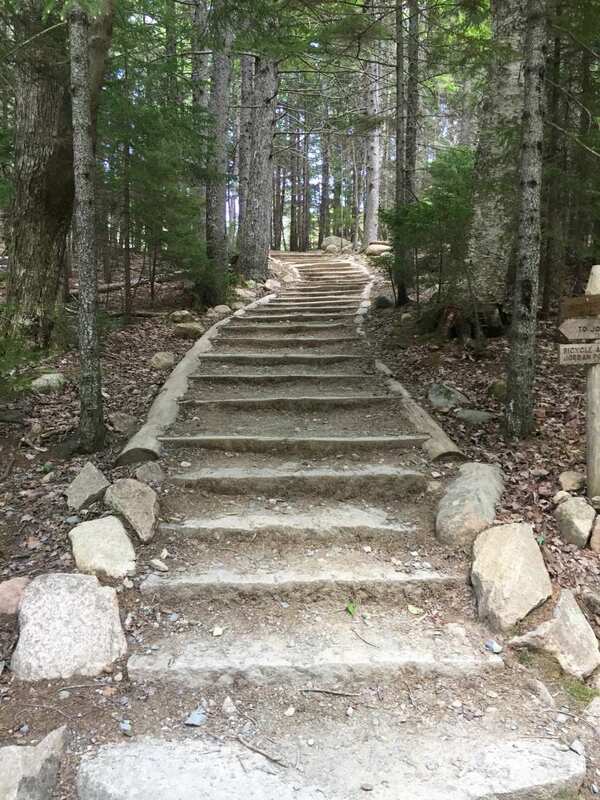 I’ve heard many in the druid community say that the best thing you can do for any piece of land is to “pick up the garbage and get the hell out.” And there are certainly times and places where I think this approach is the wisest–the ecosystem is fragile and nature is doing her own healing. Or, this is a good approach if there are people already dedicated to the cause of healing particular parts of land, like state forests or conservation areas, and you haven’t been asked to help in that existing work. But what about everywhere else? What about the lands that aren’t under protected or conservation status? What about lands that lay fallow and are struggling to come back from a lot of abuse? I’m starting to disagree that this “pick up the garbage and get out” is the right approach in every case and in fact, in many cases. I’ll use Western Pennsylvania as an example, and I’m sure readers in other places can think of their own local examples. 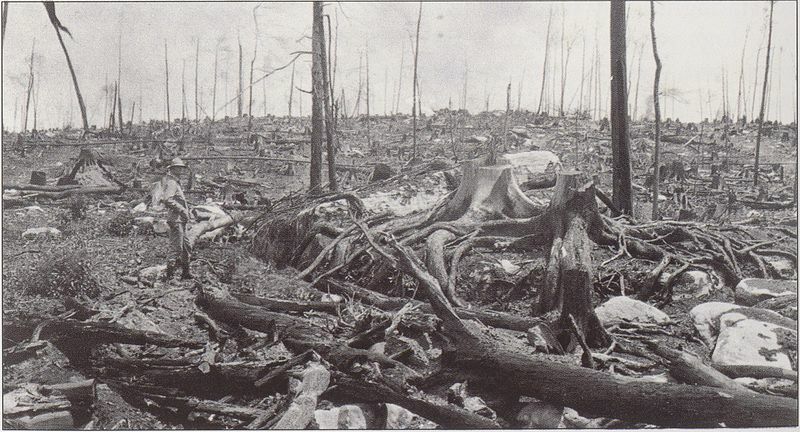 At one point in Pennsylvania’s history, about 100 years ago, the forests were almost entirely gone (see photo, right). Today’s logging looks harmless by comparison (and is ecologically much more sound, but still extremely disruptive). Trees that were 15 and 20 feet across were cut down during this time, and other resources the land held were also sought, such as coal. Since that time, regrowth (ecological succession) has been successful in some places and the forests that have returned are now mostly protected by being a state forest, wild area, or game lands (although game lands still allow fracking and logging, so I’m skeptical about this “protection”). Other forests never returned, and instead went to farmland, subdivisions, cities, airports, or something else. Even for the forests that managed to return to forest, the logging and clearcutting significantly and permanently alters the what is growing there long-term. Hardwoods like hickory, walnut, chestnut, or oak, especially have had difficulty regrowing because they grow much slower than other trees like black cherry, beech, or birch. Forest herbs on the floor also have difficulty recovering or spreading quickly, especially those who spread slowly by root or rhizome. Much of the land no longer holds the fertility or nutrients needed to support a forest. Other land still hasn’t grown back, and was farmland till the fertility in the soil was removed to the point where little is growing there–only pioneer species working to bring nutrients back into the soil. Ecological Succession is the process of nature regrowing from a damaged state. What it regrows into is largely a matter of the ecosystem and region–around here in Western Pennsylvania, the final state of succession is a forest. In the Great Plains states, it is, as you may suspect, grass plains and savanna. The damaged state could have been caused by a fire, flood or other natural occurrence, but in our era, its predominantly caused by human destruction, as in the case of the forests of Pennsylvania, or more recently, mountaintop removal in West Virginia, or boney dumps in Pennsylvania. Sometimes, ecological succession fails to happen almost entirely, even over a period of decades or centuries, because the land has been too damaged by human activity to begin that healing process (of which I’ll be speaking more about next week). As an example of this can be seen through the chestnut tree. 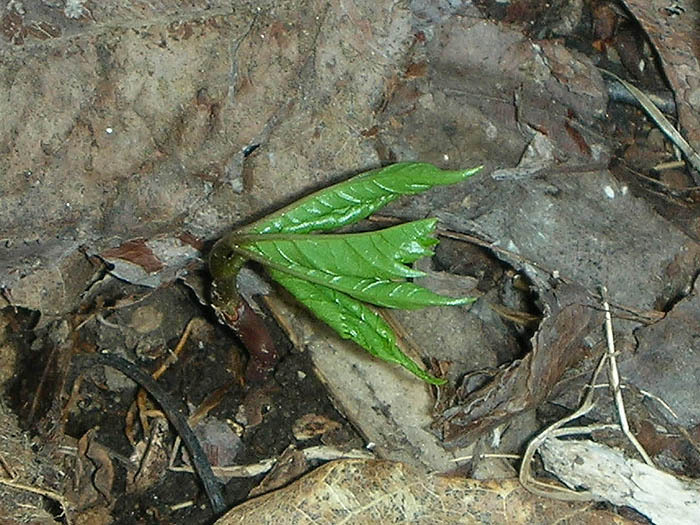 Prior to the chestnut blight of the early 20th century, chestnuts made up anywhere from 5-15% of most forests in Pennsylvania. Pennsylvania decided to cut down *all* of the chestnuts (even non-blighted ones) to try to stop the spread of disease, essentially preventing evolution from happening–the chestnut trees could not evolve blight resistance if they weren’t given a chance to do so. The result is that very, very few chestnuts remain–hence why my father works to plant them. The idea of human intervention on the landscape, in a positive direction, is not one well known in present culture. The conservationist approach, developed as a response to things like the clear-cutting that took place in Pennsylvania a 100 years ago, has done much to help re-introduce and protect forests and wildlife–and for the places that are protected, the protection generally works. 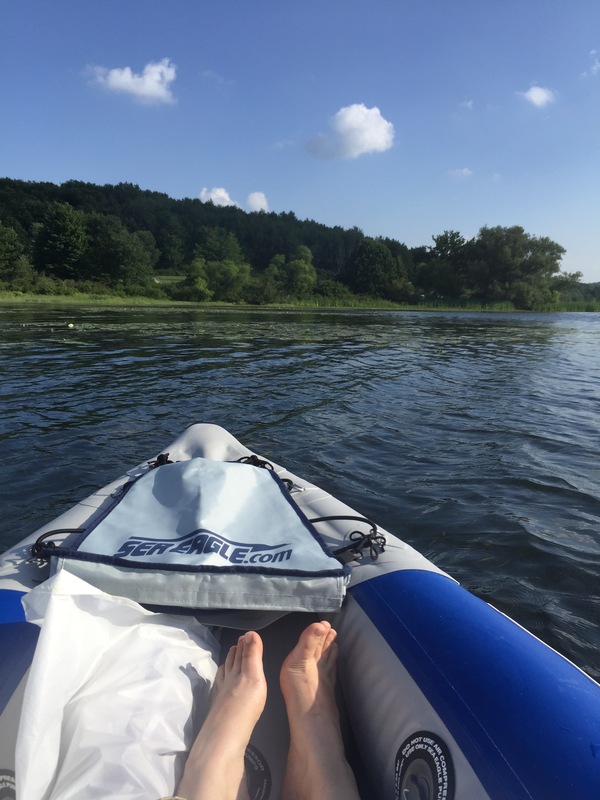 I visited the Pennsylvania Wilds (a protected area spanning 1.5 million acres of forests in North-Central PA) two weeks ago and I was amazed to read of the story of conservation there on that land. But I do think that the conservation mindset creates some challenges. 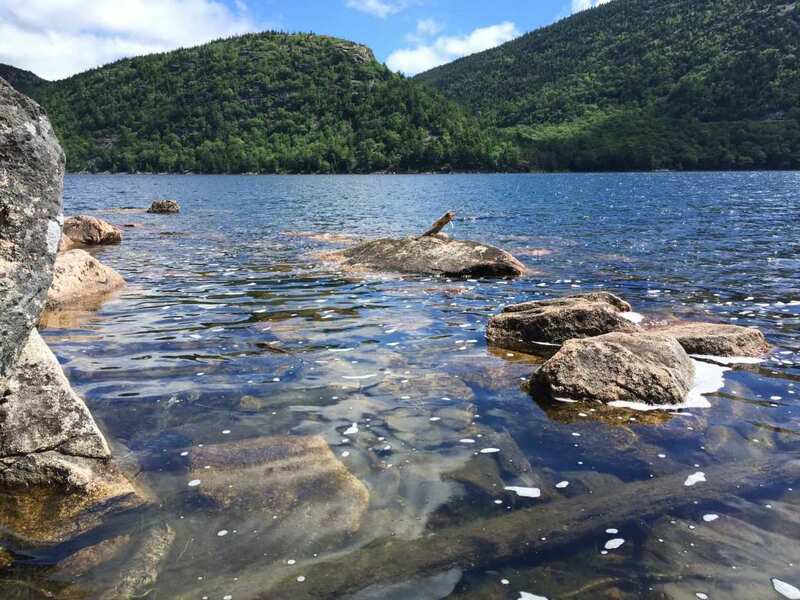 The conservation mindset is rooted in the idea that when white settlers arrived here, they found a pristine landscape, untouched by human hands. The goal of conservation, then, is to get the land back to that state and to not let anyone touch it again (because human touch is seen as problematic, and in most cases today, it is). Every day, I’m thankful that early conservations decided to set aside millions of acres of forests in my home state. Some conservationist efforts do work towards restoring native ecosystems or at least creating balanced ones. And that’s all good work. But at the same time, the situation is radically different now than in 1492–more species are here and are naturalized, animal species patterns are different (which is critical–see this video of the wolf changing rivers at Yellowstone), and I’m not sure that simple restoration to the way things were and then leaving it alone is always the best approach. I’m also not sure that leaving this regenerative work only in the hands of the “experts” is the best either because it disallows collective responsibility and action. But it certainly is an understandable response, given what has been going on for the last 150 or so years. Another approach, one I have heard expressed in druid retreats and by various practitioners earth-based spiritual traditions is “letting the land alone to heal.” But I don’t think this approach is entirely ethical either. For one, leaving a forest to regrow on its own will never re-introduce species that have been largely lost to our forests, like chestnut, because there aren’t enough of them left to spread. It will never re-introduce ginseng, goldenseal, or ramps, all of which have been over-harvested to critically endangered stats–and all of which are slow-spreading root crops. It won’t address the damage caused by erosion or soil loss–eventually, given a long time, the earth can heal from these things. However, even while ecological succession is slowly occurring on nature’s own timeline, other damages and pressures may be happening, like acid rain, mine runoff, poaching, and more. The two real issues with the idea of “letting the land alone to heal” and that, first and foremost, is that it removes our personal and collective responsibility for the damage that was done. And second, just as humans caused quick destruction, we can also help jump start and guide the healing process more quickly. This kind of work tremendously deepens our spiritual and physical connection with those lands. White mythology suggests that when settlers came to what was to become the United States and Canada, they found pristine wilderness untouched by human hands. The truth is, the lands such as those that would later make up the USA were never “untouched by human hands” as is commonly thought. Yet, the nature of the touch was much, much different. In fact, M. Kat Anderson, in a book called Tending the Wild provides a rich body of evidence that Native Americans tended the land extensively to maintain balance and abundance. Anderson learned from the Native elders she was interviewing in California that some native plants have literally evolved with human intervention and they need humans to survive and thrive—this puts an entirely new perspective on the idea of earth care and stewardship. If you think this idea that the land evolved with human touch is a bit radical, consider domesticated vegetables or animals. This idea is really no different than farm animals or even annual vegetables you plant in your garden, who also have evolved with humans and depend on them for protection and nurturing. Anderson’s work breaks down the distinction between what is cultivated and what is wilderness–all lands were tended in some way. One of the things I recently learned from Walker Kirby, a man teaching us at my Permaulculture Design Certificate who was coming out of the work of John Young’s Wilderness Awareness School, was the fact that “wilderness” as a term was quite negative in the native cultures of the northeast USA. Wilderness was it was land that had been abandoned or left untended by its people–and that was a tragic thing. This is such a different view that most humans have in industrialized nations–we have seen so much damage, we just want to leave nature alone and protect the wilderness. But in creating “wilderness” we are, essentially, abandoning our responsibility to tend that land; its not really different than abandoning elderly relatives, children, or animals in our care. The other piece to all of this is, of course, that this damage we currently have is largely human caused. Humans have some substantial Karmic debt that we can work to help payoff by directly taking action. Some humans are still causing active destruction; many more are complicit and passively supporting that destruction passively through their choices, purchases, and inaction. They turn their head and shut their eyes because they do not want to see. But for those who walk an earth-based spiritual path focused on rebuilding a relationship with nature and those who are awake and alive–we are seeing. We can help make right what was damaged, and by doing so, we rekindle the ancient bond between humanity and the land. Many of our ancestors further participated in this destruction (as their livelihoods, but still, they were participating in it), and we carry the that karmic debt as well. My grandfathers and great grandfathers worked in the coal mines and the steel mills because those were the jobs available here–and the environmental costs of those mines and mills are still very much present on the landscape of Western Pennsylvania today. Who better than their granddaughter or great granddaughter to go out and help regenerate the lands after the mills and mines closed down but their scars remain? All of us, in some way or another, are directly energetically connected to that damage which we see on the landscape–and all of us can do something, even something small, to work to heal. Anderson’s Tending the Wild gives us a radically different model for what humanity’s relationship with nature can look like. It shows that humans have been active tenders of our landscapes, engaging in regeneration and healing, and co-evolving with nature. I believe it is this same mindset that my father has for bringing in more hardwoods–it is a desire to heal the land. Imagine if there millions and millions of us, all across the lands of this great planet, actively healing the land as part of our spiritual practice. What a difference we could make–in both inner and outer worlds. Many alternative communities, whether they are druids or other healers use some form of energy healing. In the druid traditions that I practice, our seasonal celebrations raise positive energy through ritual and song and send it into the land for a blessing. Energetically, we are doing the work of regeneration–but this invisible line exists that we don’t cross; we often don’t physically do much beyond that. Because we are afraid to do harm. Because we don’t feel we have the knowledge of how to do anything else. What exactly can we do? What exactly should we do? How do we know we can do it better? How do we know we won’t cause harm? Where should this work be done? How should it be done? Part of the fear of interacting with nature, especially in a physically regenerative capacity, I think stems from the fact that we want to do no more harm. But I would argue that not doing anything is worse than the potential of doing harm in many cases. Anderson writes in her introduction to Tending the Wild, “The elders challenged the notion I had grown up with—that one should respect nature by leaving it alone—by showing me that we learn respect through the demands put on us by the great responsibility of using a plant or animal” (xvi). The work of physical land healing can bring us the power to heal the land and the responsibility of doing so. As my last few posts on the blog describe, this kind of work directly aligns with the tools and practices of permauclture design. Through permaculture, we have many examples of aiding in ecological succession faster and helping nature in this healing process. With careful observation, planning, and knowledge, we can actively help ecological succession along, actively help our lands heal. This work takes a lot of knowledge, dedication, and commitment–but it is so worth doing and worth doing well. Through many years of study and practice you’ll have more effective strategies to address larger problems, you can begin now, in this very moment. For those interested in starting the work, perhaps start by enacting the principle of “observe and interact” from permaculture design. Go into the places that are in most need of healing that we can reach. The damaged lands, the degraded soils, those places abandoned by others. Lawns are a good place to start, as are abandoned fields, abandoned lots on your city streets, logged areas. Learn about that land, learn about the soil, look at what is already growing and learn about why it is growing there, don’t be immediately angry if you find out its “invasive” (many “invasive” plants are healers, in their own way) and think about how you might help ecological succession along. And more than anything else, listen and observe, with your inner and outer senses, and see what the land has to tell you. I realize I’ve been doing this work for a very long time (as is evidenced by this early post), but the regenerative work I was doing was almost entirely focused on my homestead. I knew I was regenerating the land there, doing good healing work. Selling my homestead and being “landless” during this transition to a new state has shifted my eyes to the broader landscape. I realized that its not just about what I do on a small site, but what I do in many different places and spaces. I think that’s the work this post is trying to do–explore the broader call to heal the land beyond what we generally “own.” Its trying to cast a wide net, seeing the land differently, realizing that all of the land is ours to tend, if not legally so, than certainly, ethically so. I’ll be spending more time in upcoming posts on different ways of approaching how physical land regeneration as a spiritual practice may happen. For now, I wanted to share my thoughts about why–as druids, as people who care, as whoever you are as you are reading this–we could consider this as part of our spiritual and ethical work in the world. Perhaps sit with the idea, like a hot cup of tea made from pioneer plants in a field in need of regeneration, and consider whether you are called to walk this particular path.